beautiful, and immortal, thanks to its simplicity. After all, there is only one way to fold a piece of paper. Yet within that single fold is a universe of possibilities. With every variation of a fold, a new shape emerges. Paper folding is beautiful, and immortal, thanks to its simplicity. After all, there is only one way to fold a piece of paper. Yet within that single fold is a universe of possibilities. With every variation of a fold, a new shape emerges. In a common sheet of paper, there exists the notion of a flower, the thought of a fish, and the dream of a bird. Origami is an ancient art and its history stretches across thousands of years. It has crossed boundaries of language and culture. Its practitioners are young and old. It has survived, thrived, and turned millions of ordinary people into artists. Every generation, indeed every person who folds, has made a contribution to Origami. In the beginning of its history, Origami was a pastime enjoyed only by the wealthy due to the high cost of paper. As papermaking evolved and paper became less expensive and more readily available, folding spread throughout the world independently, as well as collaboratively, and is practiced by a wide variety of people. 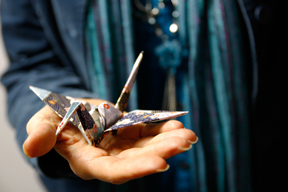 Today many Origamists fold with mediums besides Origami paper including recycled paper and other repurposed materials like plastic, fabric, and metal. Even though the history of Paper Folding dates back to the invention of paper, as a recognized art form it is fairly young. The basic techniques of this craft are constant -a crease here, a fold there - but Origami is very much a living, breathing, changing art. While some folders are content to create the simple but beautiful crane thousands of times, others prefer to experiment and uncover new, exotic forms and techniques: tessellations that undulate and repeat, modular geometric shapes that utilize underlying mathematical principles, wet-folds that come to life when dampened with water, and complicated models that take hours of delicate work and concentration. It is this variety of ideas, techniques, and models that make modern Origami so appealing to such a wide variety of people. For centuries there were no diagrams for Origami models. Creations were shared through oral teaching. In the late 1700s the first written instructions appeared explaining how to fold the crane. The earliest collection of Origami models was published in the mid 1800s in Japan. Today there are 100s of publications of models around the world. We hope to add to this vast pool of knowledge with our magazine - Creased. Happy folding to you all! History of Creased - Click read more below to find out more about how Creased was started and Sok Song's Origami Biography. Hello! My name is Sok Song, and I am an Origami Artist living in New York City. Creased, Inc. was first started in 2001 after I decided that climbing the ladder of corporate America was not what I wanted to do for the rest of my life. With the help of my friends and family, Creased began as a wholesale Origami greeting card business with the goal of creating a niche market in the stationery industry. In the first year, the Signature Line of cards, designed with simple traditional models folded from beautiful yuzen chiyogami paper, was being sold in a select number of boutiques and museum stores in New York. The Joy of Folding - We here at Creased Magazine strongly believe that the joy of Folding Paper is in the sharing... and the close knit origami community we have become in the past 30-40 years. We also felt the need for a new publication that could help spread the passion that we all share in paper folding - something to bridge the gap between Origami newletters/collections and Books.. The content and models for Creased are tightly edited and tested for wide appeal to various folders. We are dedicated to making sure this magazine will be a great new tool for sharing and spreading the joy of Folding! Thank you for visiting our site! We are working hard to bring you a great online resource and an awesome magazine! Check back often for updates!